Quick highway access affordable prices and money-saving extras like a free continental breakfast and internet access make the Americas Best Value Inn Dillon a good deal for on-the-go guests. You can catch the evening breezes from the balconies of the rooms at the two-story Americas Best Value Inn. Exterior corridors let you park near your door and Wi-Fi connections TVs with cable channels mini-fridges and microwaves are among the amenities. A complimentary continental breakfast is served in the bright and sunny solarium-style dining room. Parking is free and pets weighing less than 50 pounds are allowed for a small nightly fee. 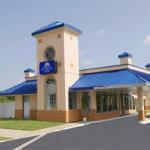 Off I-95 the Americas Best Value Inn gets you on the highway in less than a minute. Family-friendly eateries are a short drive away. Downtown Dillon and attractions like the Dillon Country Museum are just over a mile away. If you're looking for great fishing Little Pee Dee State Park is 13 miles southeast. Florence Regional Airport is 31 miles southwest and Myrtle Beach International Airport is 68 miles south.